It all started with a baby turtle. I had never before held a baby turtle in my hands, its tiny fins pulling across my skin, as if it was churning up its own energy to embark on the longest journey of its short life thus far— surviving the sand, the threats of the water, and fighting for its right to live. I found myself here, on Playa Jobo in Guanacaste, Costa Rica, through a perfectly timed connection, as so often happens when working on the ground in a location. My job as a trip leader with National Geographic Student Expeditions grants me the opportunity to plant new seeds in a location; in this case, the area in and around Cuajiniquil, Guanacaste. Nat Geo Student Expeditions is a branch of National Geographic that encourages students from all over the world to explore other cultures and engage with different communities. There are photography, writing, science, and community service expeditions in over thirty countries. I am one of the co-leaders for the Costa Rica community service expedition. Most of our work takes place in Cuajiniquil, a small fishing town close to the border of Nicaragua. There, we have painted the community center, created murals on the high school walls, taught English, assisted farmers clearing their land, and helped to increase tourism to this part of Guanacaste, but we have never before ventured onto the sands of Playa Jobo, even though it is just a mere thirty kilometers away from Cuajiniquil. 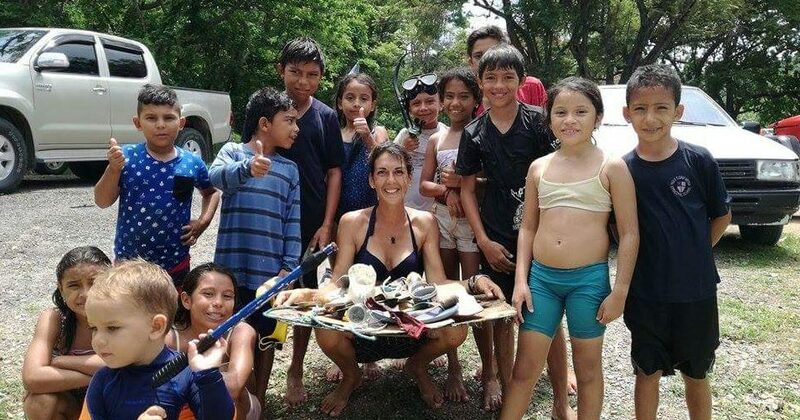 My connection that brought me to this turtle release is in the form of a sinewy French woman named Mathilde; she is the Environmental Educator and volunteer coordinator of ETC, Equipo Tora Carey, or Team Black and Carey Turtle. Only a year older than me, Mathilde holds herself tall as a woman who has seen, and done, much more. She is the type of strong spirit you hope to win over as a friend, who you want supporting your arguments in a debate. Her values for conservation are strong, and extend into her everyday practices. A friend of a friend had connected us, encouraging me that the two of us should get together, and so, over coffee sips and talk of turtles, a new partnership was formed. That first meeting, Mathilde explained to me the work of ETC. 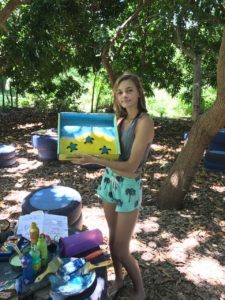 ETC is a NGO based in the town El Jobo; it was started by Maike Heidemeyer, a marine biologist and conservationist, almost two years ago. 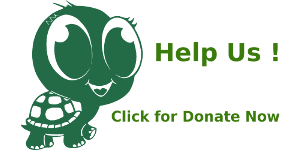 ETC has various branches, but its mission is based in conservation, research, and accumulation of resources for yellow neck parrots, sea turtles, and rays. It is an organization intricately woven into the fabric of the El Jobo community and the surrounding beaches. Maike knows that no change can be sustainable without the investment of the community members themselves. She and her team, including Mathilde, work with local fisherman to provide education about sustainable fishing practices, about turtle habits and nesting, and about recycling. 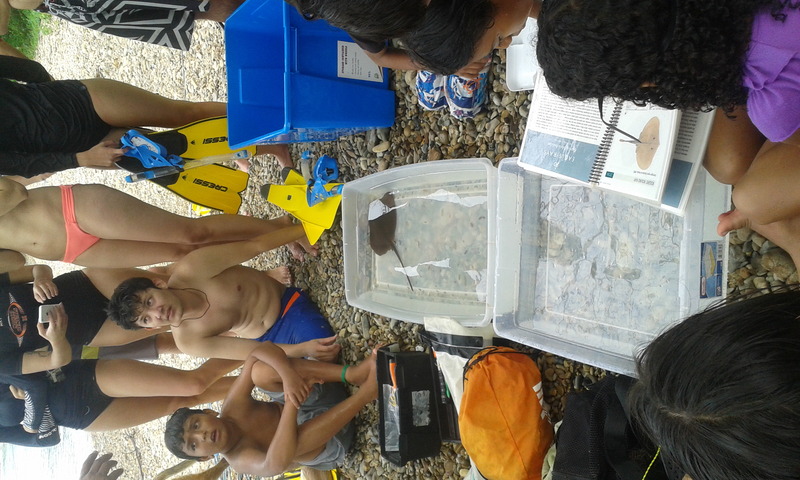 The team also teaches kids in El Jobo about the same topics, as well as how to tag and collect tissue samples from rays and turtles. The data is used to prove migratory patterns, genetic of the species and to determine areas for protection. 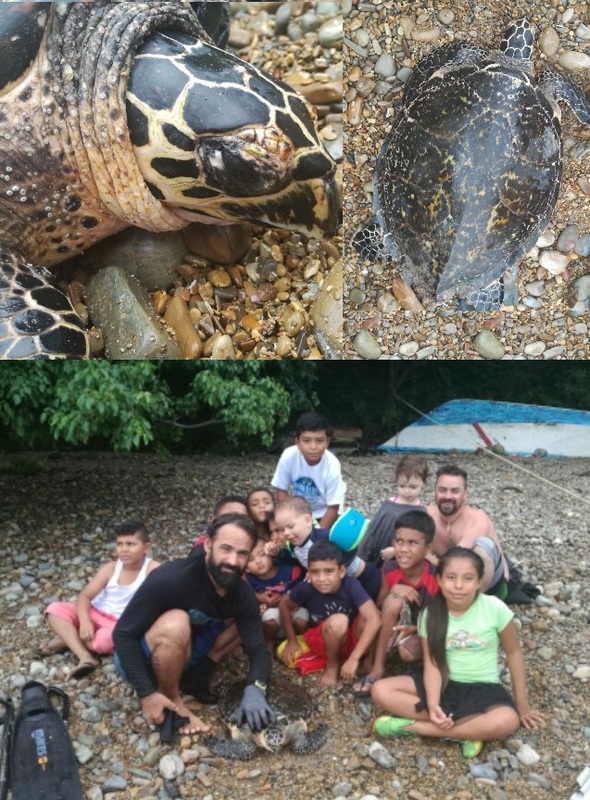 We planned that some of the students I was leading in Cuajinquil could come to help out at one of the kid camps on the upcoming Saturday; they’d clean the beach, tag rays, and snorkel to see the turtles. But before that day came to pass, Mathilde sent me a message early Thursday morning: ‘Baby turtle!’ Later that afternoon, I drove over. I had always loved turtles, but knew very little; in fact, turtles remain a mystery for many. Biologists know they eat jellyfish. They know there are eight species of sea turtle in the world (although this is arguable; some biologists say seven); five of them nest along the shore in Guanacaste. In this particular area of northern Guanacaste, around the peninsula known as Punta Descartes, there are three sea turtles that come to nest: Pacific Black, Olive Ridley, and Hawksbill. Pacific Green and Leatherback also frequent the coast further south. Playa Jobo, where ETC is based, has been said to be one of the most beautiful beaches in Costa Rica, but it’s also one of the areas that has seen immense drops in the turtle population. Just off the shore of Playa Jobo, a little further south, a large alimentation site brings red snappers, manta rays, sting rays, sea turtles, lobster, octopus and more. It’s the secret feeding ground of marine creatures from here and from afar— sea turtles from the Galápagos Islands have been found at this site—but the secret is known by the large fishing companies as well. The majority of fishermen, who have fished their entire lives in these waters, utilize methods that optimize productuction, namely large nets with small holes. Even though the fishermen from El Jobo and the surrounding area operate on a smaller scale and don’t use such nets, larger companies from elsewhere in the country do. They drop their lattices to the ground and leave them there overnight, white-toothed jaws lying wide open; the jaws lazily close the following morning around baby fish not yet mature, and all colorful flaps and wriggles of bycatch– turtles, octopus, and even the occasional baby shark. What happens to these creatures when their existence is noted by the fishermen the next morning? Their corpses are left to float away on the waves, to sink or to be eaten; the fishermen shake their heads, counting what gives them profit, never noting the uncountable. Along with the dangers in the water, the populated, touristic coasts of Costa Rica present their own challenges. The beaches, whether sand or rock, are often peppered with trash: plastic bottles, miscellaneous plastic, bottle caps, beer cans. 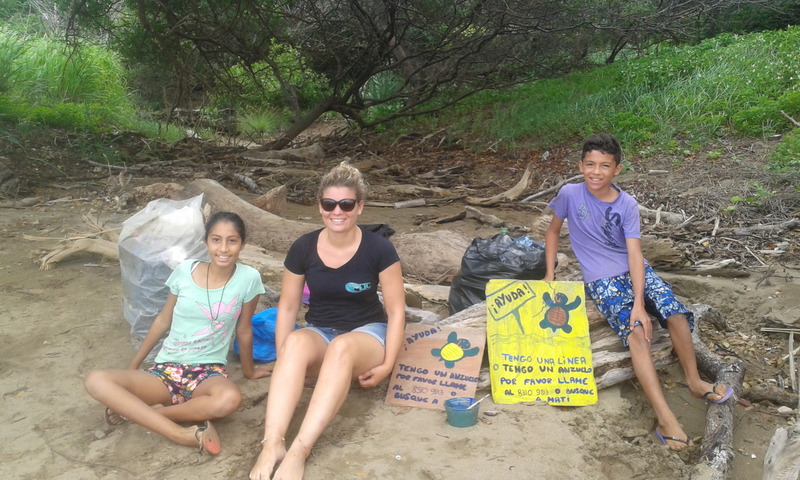 Our Nat Geo group had worked with the Leatherback Turtle Trust in Playa Grande a few days before I met Mathilde; we learned about the conservation specifically of leatherbacks as we helped clean the beach. 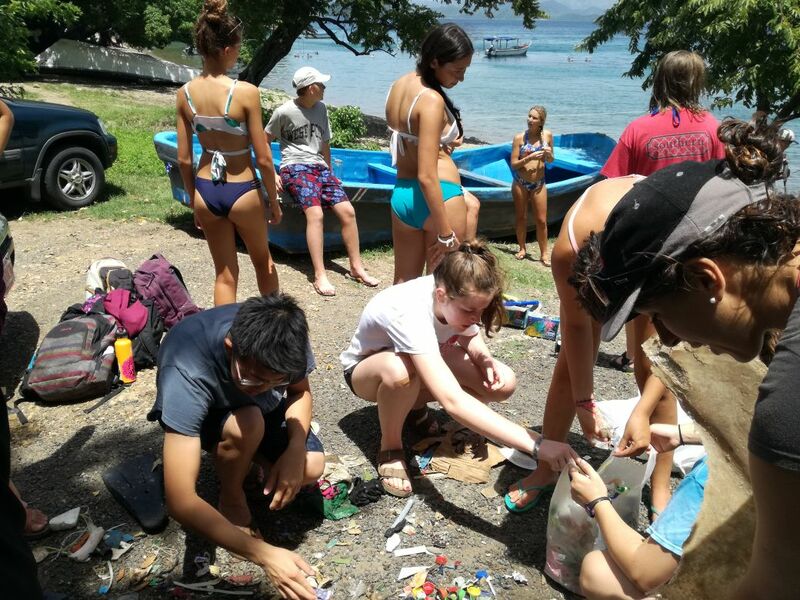 During a three-week period, the students from National Geographic Student Expeditions and Putney service trips collected over 18 kilos of trash, and this was just on a 500 meter stretch of land. Many of these beaches appear pristine at first, straight out a calendar or catalogue. But a bare foot and astute gaze sees beneath the polished promise of Costa Rican beaches: a toe crunches plastic and shell fragments alike; a forgotten Coca Cola 2L bottle rolls between the tall grasses. Where there are humans, there are our remains. 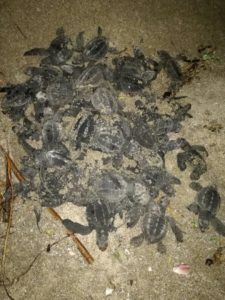 Other manmade threats dissuade turtles from coming ashore to nest: light pollution, beach chairs left in the sand from resorts, restaurant tables left out overnight, bonfires after sunset, and campers with lights above their tents. All of these factors lower the population of sea turtles in this part of Costa Rica. There used to be over one thousand leatherback sea turtles who came during the high season, September-November, to nest in Playa Grande; this past high season, there were eleven. Although other nesting areas around the world report that their Leatherback population isn’t declining, on this western coast of Costa Rica, the population has plunged. Hawksbill turtles typically lay eggs from May to August; Pacific Black lay from August to September and December to January. The small Ridley turtles lay year round, especially in this northern part of Guanacaste. Here in Playa Jobo, biologists and locals have noted a significant decrease in turtles nesting as well as visiting the alimentation site. Why are some populations of turtles in the world increasing, or staying the same, while here in Costa Rica the decline has been so rapid? Biologists, locals, and conservationists here know the threats, both on and off shore, but single-sentenced answers are too neat and tidy for this mess of a situation. ETC is one such group attempting to answer that question. One way of addressing the problem is to work with local partners. ETC offers classes with fishermen who, after years of fishing, have now changed their livelihoods to become conservationists instead. One of them is Pirricho. Pirricho is the brother of Randall, the first man from El Jobo who started working with ETC; Randall is lovingly named “the turtle man,” and he has been committed to the project ever since his first night patrols for turtles two years ago. Between the two brothers, they walk the sand every night of the week, receiving a small stipend generated from volunteers who work with ETC. Their patrols are what led to the discovery of this particular nest that Mathilde had texted me about when she frantically messaged, “Baby turtle!” Pirricho had found a nest on Playa Coyotera, one of the neighboring beaches to Playa Jobo, and ETC had to make a difficult decision. Due to its high tide and the large raccoon population, Playa Coyotera has nearly a 100% mortality rate for turtle eggs. 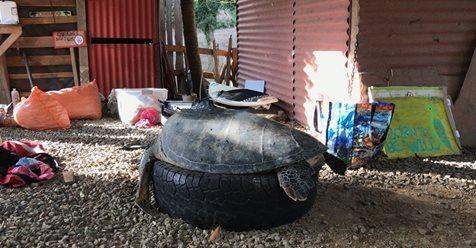 The organization decided that, to protect the eggs and give them a better chance for survival, they had to move the nest to a new location so that the turtles would have a stronger chance for survival than their certain demise in the little jaws of raccoons or the rolling waves. They transplanted the nest to Playa Jobo. This decision was taken with extreme care, because as far as humans know, it’s important for turtles to come into the water on the same beach where their nest is located. Survival of the fittest, aided by human intervention; it’s not in keeping with the ways of nature, but sometimes, I suppose, human hope transgresses the environment’s declarations. 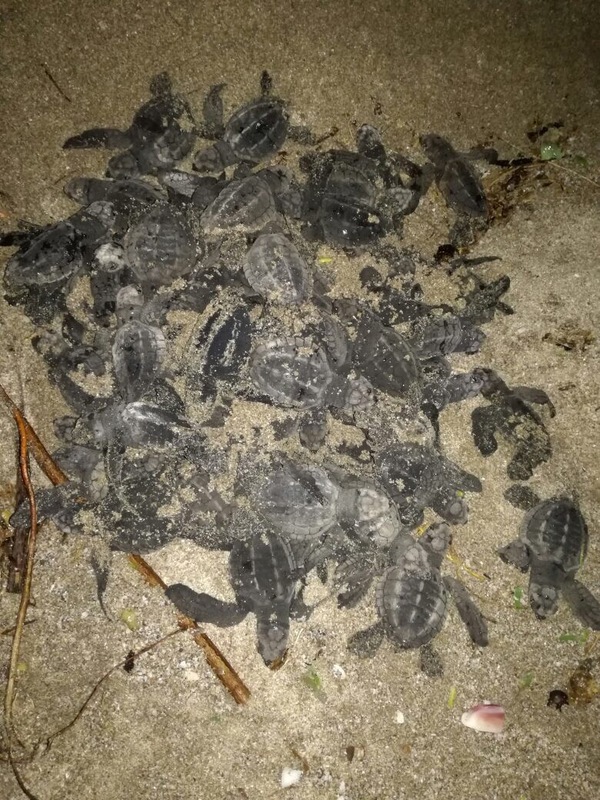 But still, I’m left to wonder, will these baby turtles return here, to Playa Jobo, or somehow, will something deeper within them pull them to Coyotera, a few kilometers away? Typically, though not always, female turtles return to lay eggs on the beach where they were born. This is controversial: a tagged Galapagos turtle came to lay on these beaches just a few years ago. It is a mystery of turtles– just how do they know to return to the beach of their birth? Born here, in the Costa Rican sand, they’ll travel on currents down to the tip of South America, yet somehow return to these tiny beaches, a few hundred meters long, to lay their eggs. Fifty days ago, Pirricho, the fisherman turned turtle-walker, had found the nest, and on this lazy Thursday morning, the baby turtles cracked their shells with their miniature beaks, ready to make their way to the water. ETC gathered the baby turtles so that they wouldn’t start their trek during the day when the sand was already populated with beachgoers, campers, and fishermen. They guarded the turtles until sunset, when I arrived along with a small group of others curious to bear witness to this pilgrimage. I came with the expectation of seeing one turtle. I didn’t realize I would bear witness to the trek of 127 newborn creatures instead. Mathilde gathered us in a circle, marking an arc for us to stay behind, and placed a baby turtle in each of our hands so she could count them. We lowered our palms to the wet earth and watched the flippered souls stagger their way across the sand, dragging their little fins. Young life, ferociously pulling itself forward, to the dark waters ahead. Out of every turtle nest, which can hold up to 200 eggs, although most around here hold between 70 and 130 depending on the breed, less than 10% will make it to adulthood. Some biologists say only one will survive from every nest. Of the 127 eggs that hatched, there were only a handful of deaths before they made their way into the surf. After that, the unknown begins. As our small group watched the baby turtles travel toward salvation and security in the waves, we knew they also moved toward mystery. Humans don’t know what happens to a sea turtle between its arrival into the waters and its return to nest. “The lost years,” conservationists call it. 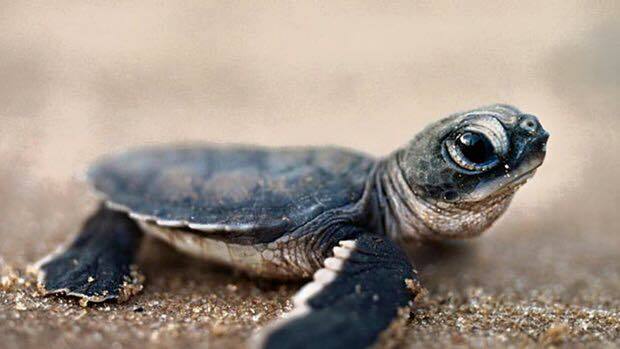 So few baby turtles survive from a nest that it wouldn’t make sense to tag every baby turtle; only when they return to a beach to nest can conservationists tag them to start following their trail, to start attempting to understand these creatures with jelly-swallowing beaks and armor-coated flesh. But now, they feel so soft, their shells not yet hard, their bodies pulsing in my palm. Just as humans don’t know what happens to the baby turtles, the turtles themselves are left to figure out their first decades of life. They expend so much energy in their first five days of swimming. This last baby turtle in my hand, one of the last from the nest, it will try to find a current when it finally makes its way past the waves lapping the shore. It will try to avoid the laughing larger fish that watch baby turtles learning how to swim. This turtle will struggle to find something to eat; it will seek algae to cling onto as it drifts along the current until, finally, it gains enough weight to float on its own. And yet, without knowledge nor guidance, except for perhaps an internal instinct, this baby turtle slides from my hand across the sand, from the sand into the dark waves, always moving forward. We humans are left to watch as their small shadows in the twilight embark into the unknown. We’re left to contemplate what we can do to improve these shores and waters so that, 25-40 years from now when a female return, perhaps she will find a place where she feels, temporarily, as though she’s coming home. What a perfect ending today for the kid’s team “los Protectores del Medio Ambiente”. 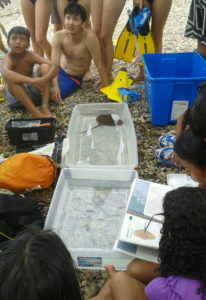 After 3 months studying the sea turtles of Punta Descartes, today was the last class for the kids. 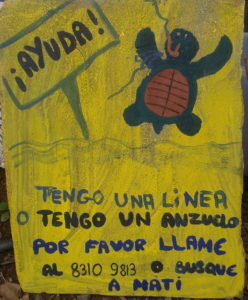 After the class we started the topic of responsible fishing at Manzanillo Beach. Suddenly, one of our researchers, Damien of Jobo community came out of the water with a juvenile Carey Turtle. A short moment later, they were identifying, measuring and tagging our new friend: DPA (Damien and Los Protectores del medio Ambiente). Soon DPA was back in the water. This was an amazing end for the students of the sea turtle program. The promise of protecting those turtles are a good start for the next environmental education topic which is ” RESPONSABLE FISHING.” DPA like all Carey Turtles feed on small fish, making fish nursery protection a vital aspect of Carey conservation. Thank you DPA for coming into our lives and inspiring our kids ! Sea turtle conservation is an everyday task. 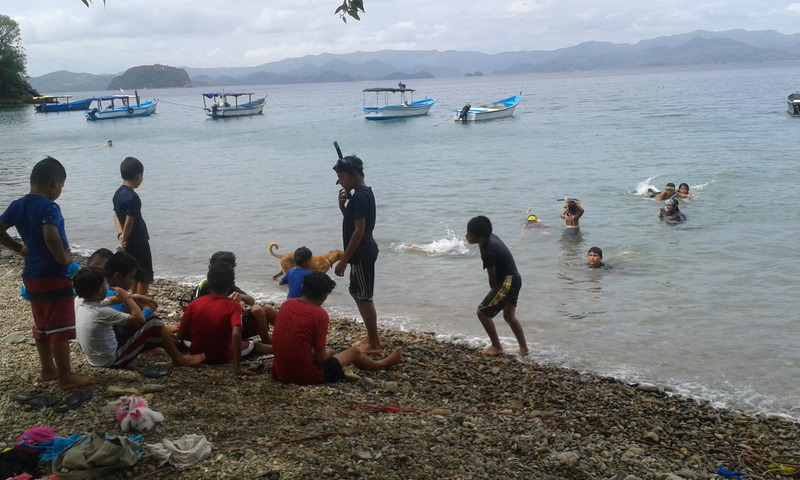 Today, we went at Copal Beach with two future turtle biologist. They are part of the kids group Los Protectores del Medio Ambiente. The mission today was designing and creating wood board signs. The signs inform the public “Please do not release a sea turtle tangled on a fishing line or having an hook on its mouth, call …. or seek Mati for assistance” . Please do not release a sea turtle tangled on a fishing line or having an hook on its mouth, call …. or seek Mati for assistance. After putting up the signs we cleaned the beach. During the clean up we talked about the origin of the trash, specifically plastic and its impact on sea turtles. Plastic is a huge problem for sea life. It affects sea turtles, birds, fish, mammals, and even invertebrates. We classified the trash that we found along the beach according to International Coastal Protocol. In total 13kg of trash was collected. The result was Plastic as a clear WINNER: 42 plastic bottles, 60 plastic food bags (mostly wrappers), 41 m of fishing line, 85 small pieces of plastic smaller than 2.5 cm. Not surprising 100% of the plastic was from Costa Rican products bought at local supermarkets. Some of the material found was sent to recycling. Thanks again to the Protectores del Medio Ambiente for joining this hard fight for nature. They are our future we are proud of them .PLEASE help them by not forgeting your trash on the beach . Después de crear los rotulos y colocarlos en un lugar visible patrullamos toda la playa buscando basura y hablando del problema del plastico en los océanos. La colecta dio como resultado cuatro bolsas de plastica llenas; 13kg en total de basura. La basura se clasifico segun el protocolo de international Coastal Clean Up. No dimos cuenta que una vez mas el plastico es el desecho mas importante en la suciedad de nuestras playas. Un total de 42 botellas plásticas, 60 envoltorios plásticos de comida (chips, galletas, confites, etc. ), 41 m de linea pesquera y 85 pedazo de plastico o estereofon de un tamaño inferior a 2,5cm fueron encontrados. El 100% de las marcas de la basura eran marcas que se encuentran en los supermercados de Costa Rica. Se envío a reciclar todo el material posible. Gracias a estos niños por envolucrarse tanto con estas actiones tan inportantes para nuestra planeta! Somos orgullosos de ustedes. 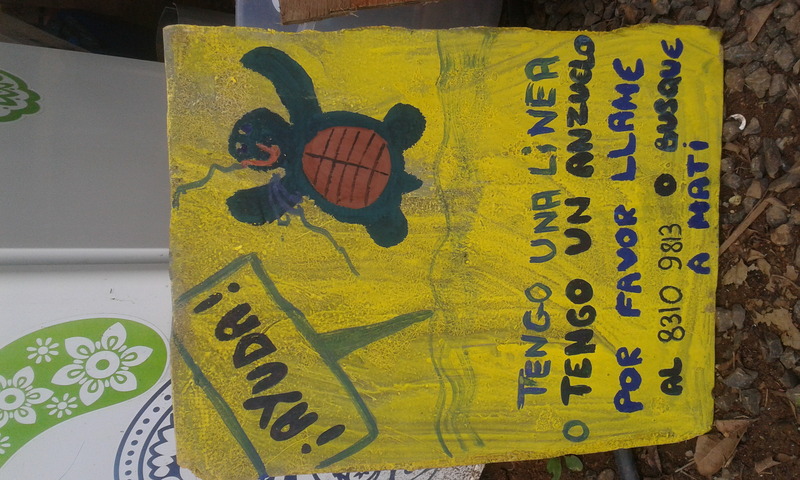 PASO UNO: NO OLVIDES O NO BOTES TU BASURA EN LAS PLAYAS O EN EL MAR !!!! Tiempo de limpieza de Playa Manzanillo! Una vez por semana vamos a limpiar Playa Manzanillo o Playa el Jobo y sus arrecifes. Esta accion consiste en recoger todos los desechos grandes o pequeños. Es difícil imaginar la diversidad de desechos que se encuentran en las playas o sus aguas. En ocaciones nos encontramos refrigeradoras o partes de ellas como puertas que los niños usan como tabla de boogy y dejan botadas en las playas. El día de hoy limpiamos Playa Manzanillo con los Protectores del Ambiente; grupo de niños y niñas 2.5 años a 15 años. Empezamos por el mar. Armados de equipo de esnorkel y bolsas de malla, exploramos las aguas azules de playa Manzanillo. Los niños ayudan bastante y llaman a Mathilde cada vez que descubren desecho bajo del agua que no pueden recoger ellos mismos en razón de la profundidad. Así, entre ella y ellos recogimos bolsa de chips, fibra de vidrio, latas, bombillo, bolsa en cartón…en resumen un poco de todo. En la playa muchas latas, filtros de cigarrillos, botellas plásticas y vidrio, bolsas, papel de confites, miles de tapas y pajillas…Resulto que en 3 horas recogimos 10 kg de basura. Súper orgullosos, los niños me enseñan cada uno de los desecho recogidos. Además recogieron un esqueleto de raya látigo para Sebastián (el profe de la rayas). Es increíble observar como estos niños se implican y toman en serio esta acción. Nadie se escapa o anda de vago, todos están súper motivados. Yo creo que acciones así les sensibilizan y les educan. Ellos dicen que siempre les cuentan todo a los padres así que tengo el sentido que ellos mismos van a sensibilizar y educar a sus padres. Estos niños saben diferenciar los desechos reciclables o de aquellos que no lo son, saben que una tortuga puede morir por haber confundido una medusa con una bolsa plástica. Mathilde hizo un gran trabajo con este grupo de niños gracias a sus clases de educación ambiental. Todos parecen consientes de la importancia y del impacto de sus acciones y del desastre que pueden generar los humanos.